During the routine you see a matchbox open by itself and you have a wonderful opportunity to take a picture of your daughter wearing my special birthday cake hat. 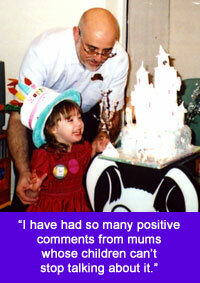 To go back to the story of your daughter’s party with Mr Mysto simply click the back button on your browser. To enquire about me attending your daughter’s party simply call 0800-0188118 (best from a land line) or 01737-350586 (best from a mobile).